meh 4days to finish the background ;_; ..
Beautiful vector! I like the background! wow its beautiful, the only qualm i have with it is that the highlights on the bow are too severe, it kills the softness of the rest. other than that its really soft and awesome! Wow, this looks very lovely! Love the soft colors! 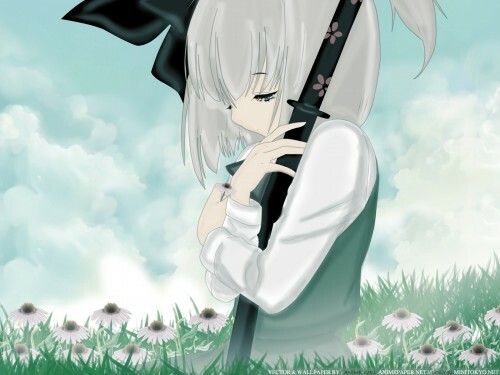 This would be Youmu Konpaku from Touhou. You have greatly done the expression I love it! Keep it up and thanks for sharing~! Mmmm love it :D Would you make a widescreen version also 1920 x 1080? Very pretty. The colors used and everything else about it just gives it a gentle, soft feel. i cannot find a better title for this one,good job! Really nice wallie. I luv it. I must watch the anime..
>"this anime is luv"< -This wallpaper is luv! >i hope you'll like it< Of course I like it. It is sad, and loneliness fits it for a title like no any other else! But also on the other side a kind of "innocent sweet" show's up on it. Really it looks good painted like it is, so your effort with vectoring and painting has get acquit on the end, and we got it from you a wonderfull wallpaper!